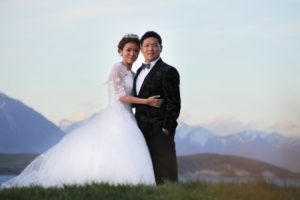 Wanaka weddings, the ultimate New Zealand destination for your wedding day. It has recently been listed as one of the world’s 10 most romantic places to have a holiday. With the sparkling blue lake, snow capped peaks and crystal clear rivers, we are not surprised. 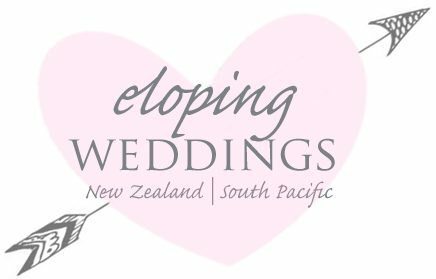 Our eloping weddings on the peak of a mountain including world class wineries will exceed your expectations. 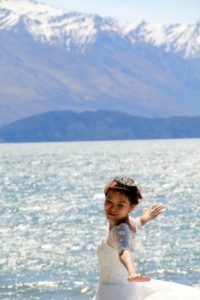 Wanaka has always been a special place to elope and we would love to assist marrying you both too. Wanaka sits on the edge of the crystal clear waters of the aptly named Lake Wanaka and surrounded by lakeside trees and the Southern Alps. It is also the gateway to Mount Aspiring National Park. This area is a popular international ski area that offers excellent and stunningly beautiful ski fields. Cardrona ski field is the most popular which also boasts the infamous pub. The Cardona pub is ideal for a cute little vintage wedding ceremony. Wanaka has a more layed back and relaxed feel when compared to it’s neighbouring destination, Queenstown. 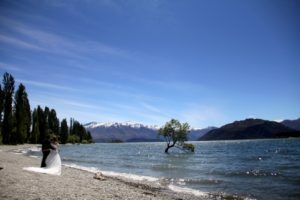 If you want a relaxed and pretty wedding destination then consider Wanaka weddings for your elopement. Coromandel Peak offers out clients spectacular panoramic views over the entire Wanaka area. Almost all of the area can be seen right up to the majestic peak of Mt Aspiring. We like to offer our clients an exclusive helicopter flight to Coromandel Peak and the new hotspot, Twin Peaks. Starting with hair and make up we then head to the airport for our flight and wedding ceremony. Concluding with an amazing photo shoot with breath taking panoramas of the lake. Fog Peak has uninterrupted views of the Matukituki Valley and the views continue all the way up the Southern Alps. We fly our clients by helicopter to Fog Peak which is a treat in its self. The best part comes after when we land and commence our wedding ceremony and enjoy a photo shoot shortly thereafter. Fog Peak has an amazing vantage with breath taking panoramic views of the lake. Our package includes the following. Isobel Glacier offers our clients a unique opportunity to have a wedding ceremony and photo shoot amongst the beautiful scenery of Mount Aspiring National Park. Mount Aspiring National Park is home to New Zealand’s second highest mountain and the views won’t disappoint. Mountains, glaciers, rivers and alpine lakes all frame your amazing wedding photography. Our Isobel Glacier heli-wedding package includes the following. Want to add a Lord Of The Rings Tour to your NZ holiday? We have all the contacts to create a fantastic LOTR adventure holiday or take it once step further and marry in Hobbiton itself.